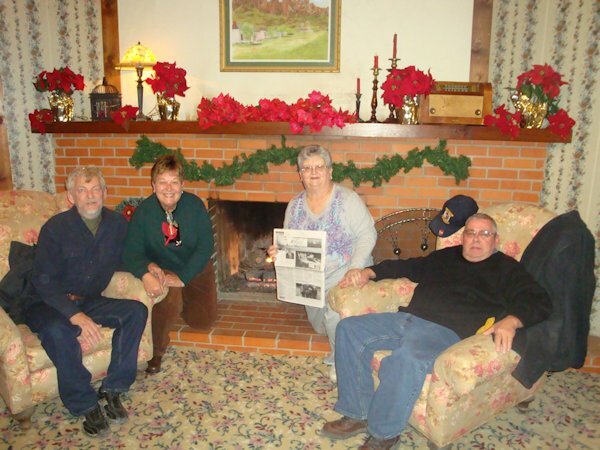 "The Quill" traveled along with Sharon and Lynnea Dowell (left) of Havana, IL and Loren and Reva (Hartman) Dowell of Round Rock, Texas to the Big Bend National Park and surrounding areas in west Texas the first week in December, 2013. Here they are with "The Quill" in front of the fireplace, relaxing in the beautiful Hotel Limpia in Fort Davis, TX. Sharon and Loren and Reva Dowell all grew up in Stronghurst. Sharon and Loren's mother is Madeline Dowell, resident at Oak Wood Estates, Stronghurst and will be 99 this year.